Premier Houseboats are pleased to present Dunravin, a static narrow boat that has recently had a lot of work done internally to create a cosy floating home, and is now available for purchase . 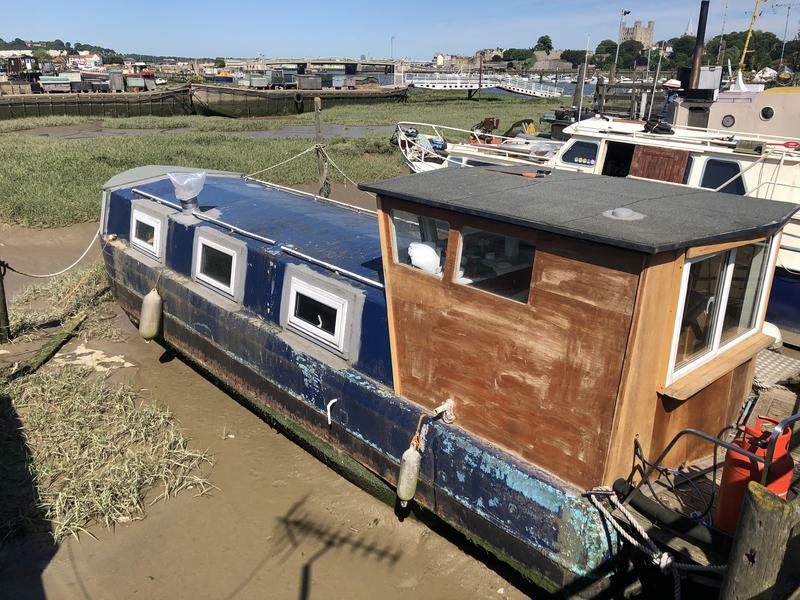 Dunravin is moored on a residential mooring just 10 minutes walk from Strood station, and her mooring benefits from stunning views across the river to Rochester castle. Dunravin has been fully insulated, rewired, plumbed and boarded out . There is a lounge area, toilet and hand basin cubicle, separate shower cubicle, sleeping area and a wheelhouse/galley. A log burner has been put in place and just needs the flue connected. A small gas water heater will be needed to create hot water. There is a small amount of internal finishing needed, and externally some painting needed, but apart from that she is ready to use. Planned to be used as a weekend retreat by her previous owner, she could also be used as a full time home if needed. Vessel name: Dunravin Vessel condition: Good Year constructed: 1969 Berths: 2 Cabins: 1 Heads: 1 Length over all: 40' Beam: 6' Maximum draft: 1' 6" Hull material: Steel Hull type: Flat Disclaimer Premier Houseboats offers the details of this advert in good faith as it was presented by the seller or his representative but cannot guarantee or warrant the accuracy of this information nor warrant the condition of the described item within this advert. A buyer should instruct his agents, or his surveyors, to investigate such details as the buyer desires validated. The Item described within this advert is offered subject to prior sale, price change, or withdrawal without notice.